Choosing the paint colors for your home is a daunting task. With so many options available, picking the right colors can take longer than the actual painting. But it's a good thing to spend time on choosing paint colors that you're happy with. The color of the room we're in has been shown to affect our moods in positive or negative ways. Your home is the place you should feel the most comfortable, and the colors of your walls should be an extension of that. Today we're going to give you some tips on choosing the right paint for your home that will fit your personal tastes but will also be appealing to just about any eye. Before you head to the hardware store to start looking at color swatches, you're going to need to do some research in your own home. While you have the freedom to choose any color you want to paint your walls, it's advisable to take a look at the colors that are already in your home--not the colors on the walls, but the colors of your furniture, floors, ceilings, countertops, etc. If you have a living room furniture set that you love and a new carpet, odds are you don't plan on replacing these items just to fit the new color of your room. So, here's what to do. Take out your phone and snap some close-up photos (I mean really close up so that you can only see one color) of your sofa, chairs, and other furniture. Open up your photos and compare them next to one another. Do you notice a color trend in your furniture? If so, one of those colors could be a great place to start your palette. There's no need to go to the store just to get a basic idea of the colors you want for your home. If you're reading this, odds are you have all the tools you need to start making a palette. There are numerous websites devoted to creating color palettes. But today we'll talk about two specific tools that will be the most useful. The first thing you'll want is to put one color into a palette maker online (Google will present you with many). This color should be the one that you want to tie the whole house together with. Have you ever head of complimentary colors? The term might make you think back to middle school art class. Complimentary colors are a type of color harmony. There are websites that allow you to enter the color of your choosing (in this case the main color you chose above) and it will give you the color harmonies for that color. Remove all furniture from the room to be painted, clearing out as much as possible. For rooms that have very heavy furniture, move them to the center of the room and cover them with a drop cloth to avoid accidental paint spills/spatters. Prior to painting, walls need to be prepared. Use a scraper to remove old paint or a steamer to remove old wallpaper. Holes should be filled and the wall surface made smooth. Seek the guidance of a professional on how to best prepare the surface of your walls as the technique will vary based on the construction of the wall. Tape off the trim work around the doors, windows and flooring, and use drop cloths to protect the carpet and floors. The purpose of priming is to prepare the wall for the application of paint. Priming covers irregularities and stains, making the paint adhere to the wall much more effectively. Priming makes the surface uniform for the application of the new paint, basically giving the painter a clean canvas to start with. 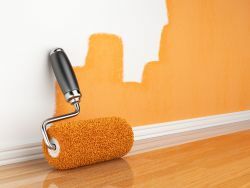 Start painting: When you are ready to paint, it's recommended to start in the more difficult areas or larger rooms first. Apply paint consistently with even vertical strokes of a brush or roller. Be certain to complete a wall before moving on to another area to help ensure the paint dries evenly. Observe as you go how well the paint is covering and drying. This will help you to determine how many coats of paint you will need to apply to achieve the look you desire. Once the painting is done, the equipment put away and the furniture back in place, you can sit back and admire a job well done.